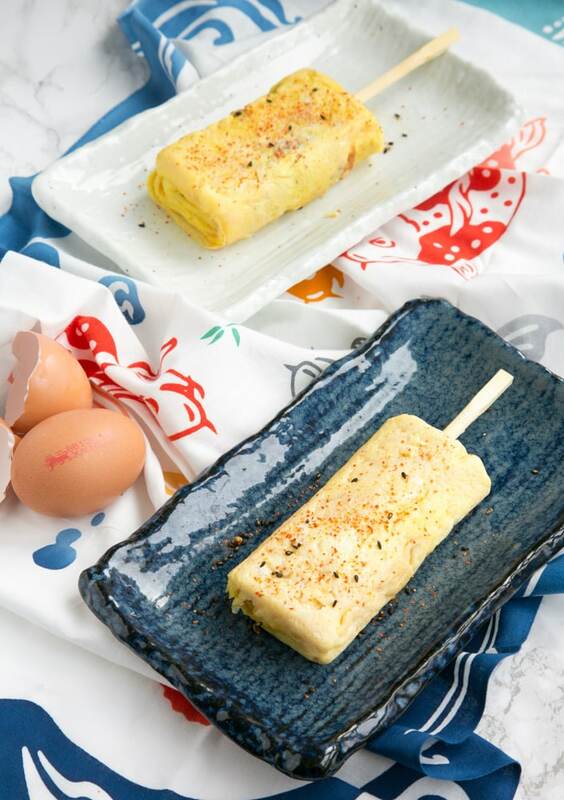 A basic 4-ingredient version of the traditional Japanese omelette – This easy Tamagoyaki makes a great protein-packed snack on the go in just 15 min. We all love eggs here, but this week even more! British Egg Week is finally back, and this year runs from the 10th to 17th October. The theme chosen this time is ‘Put an Egg On It’, which is set to encourage us to experiment with eating eggs in more unusual ways. To celebrate this occasion, I’ve partnered up with British Lion Eggs to make my favorite eggstraordinary recipe. Together with other food bloggers and London chef Seb Holmes, we’ve re-created some of our favorite street food dishes, making eggs the real star. For more inspiration, look up for the hashtag #PutAnEggOnIt and check out all the awesome creations. And don’t forget to add yours! Now, back to the egg business. I’m a serious egg lover, scrambled, poached, soft-boiled, omelettes. You name it, I’ll eat it. But as you know I’ve been in Japan recently, so I wanted to share with you one of the street foods I ate over and over again: the famous japanese omelette tamagoyaki. Tamagoyaki has a really unique taste, with a dense spongy texture and a subtle sweet note. People in Japan eat it in the morning like we could eat egg & soldiers here in UK. It’s also sold in food markets on a stick, and it’s a must in bento boxes and with other foods like sushi. Besides its sweet delicious taste, what I love most about tamagoyaki, is that it looks very pretty and holds its shape well. Thanks to its perfect texture, it can be put on a stick, making a great snack on the go. This very simplified version is perfect for tamagoyaki beginners like me. This was actually my first attempt ever. For testing purposes (and because we’re crazy about tamagoyaki at home), I remade this recipe a couple of times, and just got better and better. My tip is to start with the basics, then move along and add more or less sugar/ salt, to meet your own taste. All you need to make an easy tamagoyaki is 4 simple ingredients: large eggs, mirin, soy sauce, sugar and a pinch of sea salt. Whisk them all up in a bowl, and you’re ready to make your own japanese omelette. 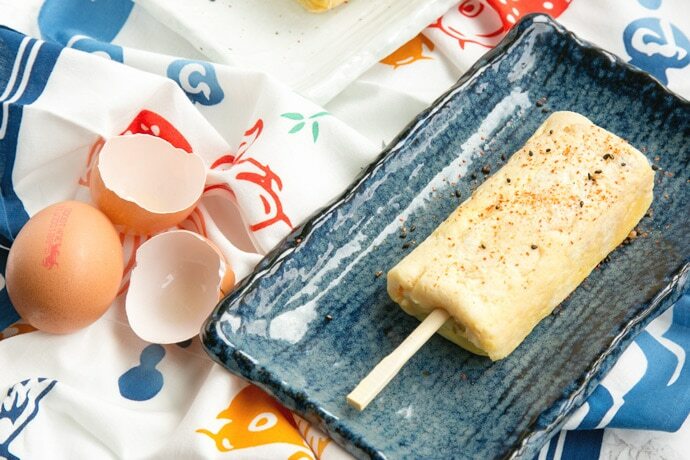 Tamagoyaki is made by thin layers of eggs cooked and rolled into a log using a special rectangular tamagoyaki pan. You may also use a simple round skillet, perhaps you won’t get the perfect rectangular shape, but you’ll still get the same tasty omelette. To make things easier, watch this helpful video tutorial, which shows how traditional tamagoyaki is made in a japanese restaurant. Don’t give up if your first batch of tamagoyaki looks a bit out of shape, practice is the secret. And make sure your skillet is always well oiled whilst you cook the egg layers. If you’re an egglover like me, or just want to get more creative with your eggs, this japanese omelette is the answer. Perfect for a quick breakfast/lunch or a protein-packed snack, this easy tamagoyaki never fails to impress! 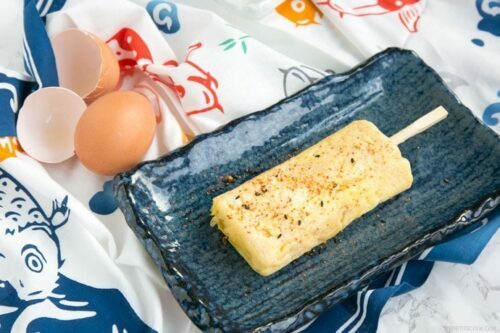 A basic 4-ingredient version of the traditional Japanese omelette - This easy Tamagoyaki makes a great protein-packed snack on the go in just 15 min. Heat the skillet at medium high temperature and spread a light layer of oil on, using kitchen paper or a pastry brush. In the meantime prepare the omelette: in a small bowl, whisk together soy sauce, mirin and sugar. 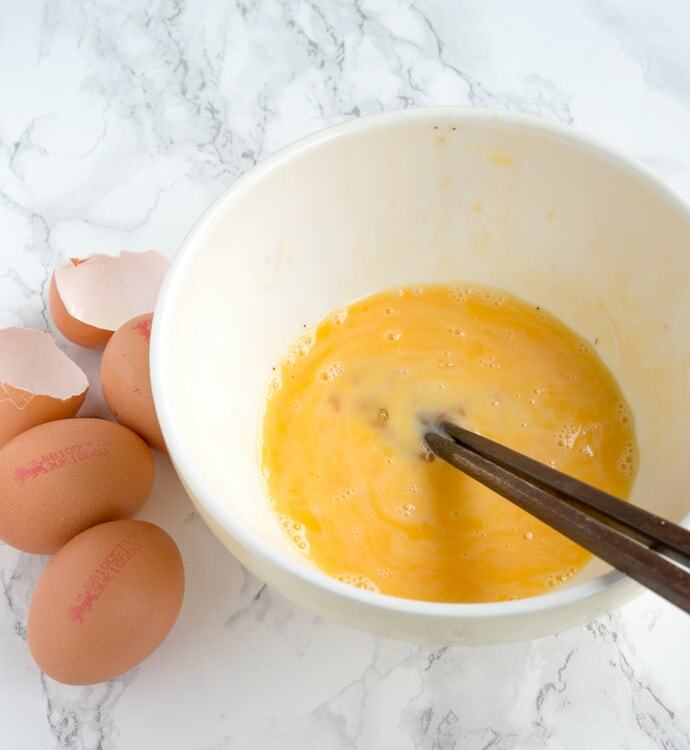 In a large bowl whisk the eggs gently, using a fork or chopsticks. Fold in the soy mixture and mix until all ingredients are just combined. Pour a thin layer of egg mixture in the skillet. Swirl it around like you would do for a french pancakes. Then, roll it into a log and move it to the end of the pan. Pour some more egg mixture to cover the rest of the pan. Lift up a bit the egg roll, and let some of the egg mixture go under it too (so that they stick together). After the new layer has set (but still slightly uncooked in the middle), roll the log back onto the the already made egg roll, and move to the end of the pan. Repeat the process, one thin layer at the time, until all the egg mixture is used up. In the meantime, cover with cling film a bamboo mat. Once your omelette is ready, gently remove from the pan onto the prepared bamboo mat. Roll the omelette tightly, pressing a little on top to make the rectangular shape, just how you would do for sushi. Allow to cool and set, then cut the omelette into large bites. Thread the omelette chunks onto sticks and serve immediately. This post is sponsored by British Lion Eggs, and as usual all the opinions are my own. I’m a regular consumer of British Lion Eggs and can only recommend their quality. Thank you for supporting the organizations that support The Petite Cook!